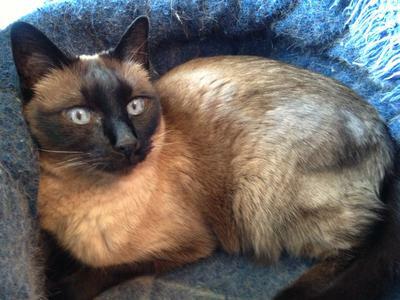 My very first Siamese cat lived to be seventeen years of age. He was a wonderful part of my life, seeing me through my single years to love, marriage and the birth of my son. 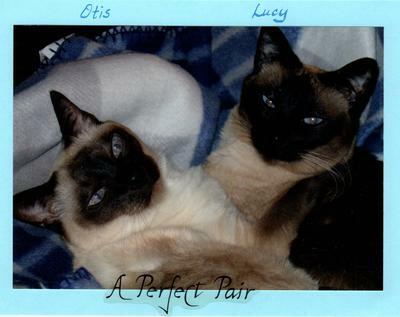 After his death and a period of loss, I began seeking a new Siamese as our second cat, a Tonkinese male named Otis, was also greatly missing him. My son and I went to a local pet store at Lambs Farm - a residential community of disabled young people and adults. The various stores on property employ the residents and provide income to the community. We found that the pet store had Siamese kittens for sale! I had intended to bring home a boy, but there was one kitten that stood out to both my son and me - a spunky little female, full of playfulness and extremely engaging. We couldn't resist her so went home with a girl, and named her Lucy Rose - Lucy for the Lucy character in the Narnia books by C.S. Lewis, and Rose for remembrance. It was my husband's birthday, so when he came home from work we presented her to him with a big bow! But truthfully, she was always MY cat - faithfully by my side, on my lap, and so in tune with me it was uncanny. She was with me through all the ups and downs of life, our son's 'growing up' years, my husband's unemployment and all the upheaval that created, new jobs, new rhythms to life ... and through it all, faithfully loving, purring and comforting! In 2012 I started a new job working from home, and I set up a little cat bed on a chair next to me. Lucy would sleep there most of the day while I was working. Wherever I was, she was never far away. Lucy lived to sixteen years of age before her little body began to shut down, at around Easter time this past spring. Oh, how I mourned her loss, and still miss her terribly. But I have a new Siamese kitten coming around the 4th of July, and I know I have more love to give and receive! Donna, thanks so much for your lovely thoughts and photos of Lucy Rose. She was clearly very much loved and cared for and they leave such a hole in our lives when they leave us, don't they? I love her name - Lucy in the Narnia books was one of my favorite characters when I was growing up (as well as my mother's and grandmother's name) and Lucy Rose is a perfect Meezer name! I'm so pleased you'll soon have another Siamese kitten to bring more love, laughter and joy into your lives, as Siamese cats always seem to do. Please come back and send us a photo of your new little one sometime! Thank you Daniel - It feels good to share her with others and have them recognize how special she was. even with a new kitten coming to me next month, she will never be forgotten! OMG I love my cat and yours certainly looks like she was a lovely baby, sorry for your loss.